3,280 feet above sea level, just outside of Da Nang, God’s hand reaches across the Ba Na Hills in a way that any visitor can both see and touch. Religious or atheist, it’s a golden moment at one of the most stunning sites on earth and it’s reason enough to visit Da Nang, Vietnam – not that you needed any others. Vietnam is a jewel of Southeast Asia with more interesting cultural fusion than most, and the country now has a tourist attraction that rivals the world’s greatest wonders. If you’ve ticked off Machu Picchu, Christ The Redeemer or Table Mountain, this is next. 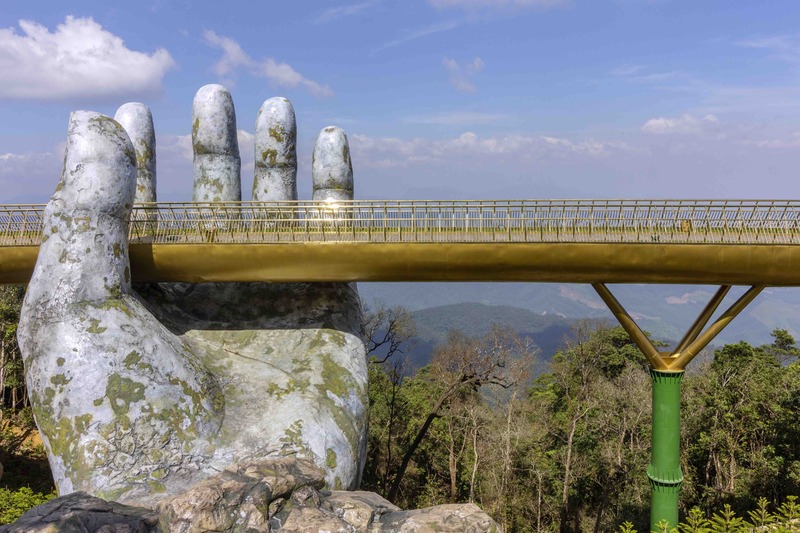 Golden Bridge, known locally as Cau Vang opened in the misty Ba Na Hills this summer to much acclaim and is just starting to catch on as the “next big thing”. The trip requires a 2 hour car journey from buzzing Da Nang, which is also quickly becoming a traveler favorite base camp, thanks to world class street food, beautiful mountain hikes nearby and postcard worthy beaches along the Son Tra Peninsula. Once you’ve arrived into the “pinch yourself” pretty Ba Na Hills after a short and thrilling cable car ride, Vu Viet Anh’s masterpiece comes to life. The artist famously told Reuters the design depicts “giant hands of Gods, pulling a strip of gold out of the land”. Between the views, stunning altitude, depth below and inspired engineering, it’s truly something to behold – and yes, you can hold the handrails the whole time. In a country where you can experience all four seasons in a morning let alone a day, it’s always an adventure, but there’s something magical about being up amongst, or even above the clouds. The Golden Bridge is part of the Ba Na Hills complex and travelers can expect to pay roughly $30USD entry. Fortunately, there are shops, a hotel and plenty to do and see. It’s kind of like Hong Kong’s “The Peak”. it’s not like you’re not going to do it. It’s too beautiful not to. “Meh”. It’s just “meh”. The Ba Na Hill is just a mini version of bad taste theme park Disney Land. Sure, if you love to look at poorly executed architecture; mismatch mimic European buildings… Mediocre restaurant and bad coffee. And overpriced, to my opinion. The only cool thing about this is the Cable car ride. I would better spend time in local Da Hang neighborhood and the beach. Hoi An is magnificent. Local restaurants have way better taste and exotic.